The album was released in the US last week on Tuesday, March 4 through Ryko on the Mystic Urchin imprint. The group made a West Coast mini-tour recently hitting the 27th Annual Ragga Muffins Festival at the Long Beach Arena where the met up with several DJ’s and VJ’s for interviews at the festival press conference. The fan response was notable and they were able to get a chance to meet and greet at a booth in the arena hosted by the Jamaican Tourist Board. In advance of the festival, the group has had some early believers on the West Coast including Indie 103.1 FM’s Native Wayne Jobson who had this to say: “One of the best bands to come out of Jamaica in 10 years, they weld molten reggae into new shapes by soldering in some lava rock. ‘Victims of the System’ is as dangerous as it comes.” The band spoke live on-air with Native Wayne by phone from Kingston, as well as with DJ Big Jim at KUCI-UC-Irvine radio, DJ Lady J at KCSB at UC-Santa Barbara and DJ Winston “The Cool Ruler” on KJEE in Santa Barbara. Trodding the reggae trail, the group then proceeded north for a series of dates that included a few with Gregory Isaacs and the Live Wyya band in San Luis Obispbo where they performed to a capacity crowd at the Downtown Brewery. On Thursday, February 21st Rootz Underground appeared at Harlow’s for a Renegade Shows event with Gregory Isaacs and blew away the Sacramento reggae massive. The next evening saw them perform in Berkeley at the Shattuck Down Low with local heroes Native Elements as part of the weekly Angel Magik event held there. And on Sunday, February 22, the group made their way to the North Bay where they met with media representatives including Laura Gardner from Jahworks.org for an interview as well as an lengthy interview and live performance on local community station Ozcat 1190 AM in Vallejo. They performed that evening produced by Good Vibez Presents with Midnite at Petaluma’s Mystic Theatre in Sonoma County. Rootz Underground looks to Midnite as an influence and guide after experience with the early Midnite days in D.C. for band members, so the evening took on a truly “mystic” feel and the crowd gave them a fantastic reception. And the vibes built in anticipation of the great Midnite segment. Other interviews that took place in advance of the release date included one recorded as program #32 with Tom-I from Big Up Radio.com for his Culture Cafe program. The tour has resumed and the group joined Gregory Isaacs on Thursday, March 6th in Chicago at the legendary Wild Hare. The received a great response and moved several copies of MOVEMENT to the supportive Chicago fans. Charles Lazarus from Rootz Underground gave an interview Sunday, 3/2 on Chicago’s Power 92 with DJ Petina and DJ Silky, known as the “Ladies of Reggae Radio.” Additional tour dates with Gregory are February 8th in Columbus at the Brickyard, March 9th in Ann Arbor at the Blind Pig, and March 11 at B.B. Kings in New York. 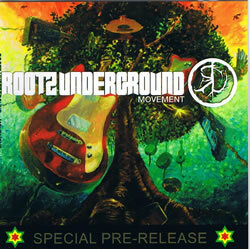 Rootz Underground is slated to make their first appearance at the South by Southwest conference in Austin on two sepearate evenings, one at Nomad Bar on March 14th and the following evening, March 15th at The Flamingo Cantina in a special reggae showcase with Queen Majesty, Mau Mau Chaplains, Katchafire, Cherine Anderson, Dokkebi Q & Grimy Styles. The latest video “Hammer” from Rootz Underground (scroll down for link) is shot in the Weldtron Fabrication shop in Kingston and directed by Luciano Biotta. It is the follow-up to “Victims of the System” their debut video which peaked at # 2 on Hype TV’s video charts, # 2 on RE TV’s video countdown and stayed at # 1 on MTV Tempo’s Cross Caribbean countdown for 5 weeks!